Offices are being allocated to the tenants and it looks like we might start furnishing very soon. If you are interested in who is being housed where, check out the Flickr page below and mouse over the image. How do I find non-profits in SL? I often get asked "How do you find out what non-profits are active in Second Life?" There is an enormous variety of non-profit, socially conscious, humanitarian and activist actions going on every day, but they are not always easy to find. Given the wide range of activities, there is not one definitive list of non-profits available as far as I know. That's how big Second Life is. Greg left a note mentioning the free monitoring service, Monastic. It doesn't have as much functionality as SiteUpTime.com, but you can monitor 100 sites. If all you are doing is trying to track when your site(s) are down then it seems like this might be a better solution than SiteUpTime. So, as an experiment I have both monitoring systems monitoring the Tech Soup in Second Life site. If I have any revelations, I'll share. 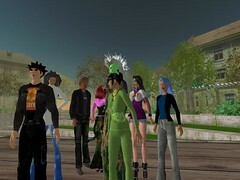 Just a quick note to say that Tao Takashi has added us to his fabulous SL blog aggregator planet.WorldofSL.com. Just one more way to get the word out on our activities. If you would like to add this blog to your own RSS feed, here's the feed link. Recently I had an Skype message from Susan, our "nonprofit administrator herder" for the Nonprofits in Second Life project. I have to assume that she was posting to the site, or perhaps reading some recent content. In any case, she IMed me because the site was down. I'm acting as the Web master, so this made good sense. I probed a little bit and came to the conclusion that the server was completely unresponsive. Website is up! 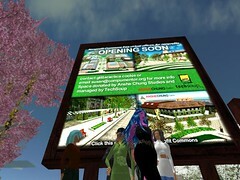 If you want to blog on the site, contact Creech Antwerp and he will help you start blogging at: http://secondlife.techsoup.org/ Comments are open for all users, so if you want to start commenting on blog entries, please do so! This week, we ended our meeting by visiting the Nonprofit Commons. Please cruise the nonprofit commons and email any problems you find to me, with a short description and coordinates. Coordinates are very important so that I can find the problem and pass it on to the ACS design team.